For ten days now, undocumented students have conducted a hunger-strike in Texas to convince Senator Kay-Bailey Hutchison to meet with them regarding the DREAM Act. Her response? 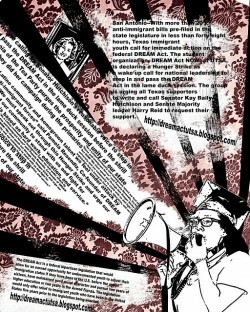 The DREAM Act does not exist as a legislation so she does not have a position on it. On the sixth day of the hunger strike in Texas, participants Pamela Resendiz, Lucina Martinez, Martha Quintanilla, Pastor John Fagans, and Felipe Vargas met with Hutchison’s aides. During that meeting, Andrea Ball, Senator Hutchison’s state director, claimed that Senator Hutchison’s position is that the DREAM Act does not exist as a bill, and that therefore there is nothing to support. That is certainly a new GOP strategy — when in doubt, deny existence of a legislation altogether. Students kindly pointed her to Senate Bill 3827, which Senate Majority Leader Harry Reid has vowed to bring up in the lame-duck session, a victory of sorts for immigrant rights advocates who perceive that the window of opportunity may not open till after 2012. Today, the legislation was added to the procedural calendar as a stand-alone bill. With the outgoing Speaker of the House Nancy Pelosi also firmly behind the bill, Democrats are looking to finally pass the legislation that would give certain undocumented immigrant youth with long-term residence in the United States a pathway to citizenship. A tentative House vote on the DREAM Act is set for November 29, though the Democratic leadership is still unsure whether it has the votes. The DREAM Act has never come up for a vote in the House of Representatives. House Democrats are expected to bring the legislation to the floor after Thanksgiving, using a set of parliamentary procedures that would bar the introduction of any amendments. The tentative plan is to bring the Senate-approved H.R. 5283, the Help Haitian Adoptees Immediately to Integrate Act of 2010 or the HAITI Act to the floor, and offer the DREAM Act as an amendment to that package. Senator Hutchison voted for the DREAM Act motion to invoke cloture when it came up for a vote in 2007. At that point, she agreed with the merits of the bill, but wanted the eligible youth restricted to renewable work permits instead of giving them a pathway to citizenship. It’s time for Senator Hutchison to wake up and see that the DREAM Act does not just exist as a bill; it exists as a movement spanning across the United States. The Senator from Texas should worry less about getting votes from the far-right during her re-election bid and care more about being on the right side of history. Tell Kay Bailey-Hutchison to meet with the Texas hunger strikers and support thousands of young immigrant students who simply want to live and contribute to the only country they consider their home. ← Previous Previous post: TSA: Transportation Security Administration or Turban Search Authority? Copyright © 2019 Prerna Lal. All Rights Reserved.